Very few films can actually bottle kinetic and visceral energy and pass it through a projector to an audience unscathed, but Whiplash consistently proves that it can do just that. Seemingly effortlessly we are placed in a position where we feel every beat against the drum skin, can almost smell the sweat and blood and where we frequently find ourselves tapping along to an infectious beat. But this position is an uncomfortable one to be in because the film is as tragic as it is rapturous during its chronicle of great determination and the sometimes literal mental and physical destruction that results from a pursuit of greatness. Director Damien Chazelle here proves that he was born with filmmaking in his blood. Whiplash is one of the most accomplished films I have seen in years; it’s thoroughly cinematic in its approach, as emotionally intimate as it is in your face and it savagely dares you not to get caught up in its contagious ferocity. Given that it is surprising to learn that Chazelle is a relative newcomer to the role of director; he directs with a clear vision and confidence and I, along with thousands of others, can’t wait to see how he develops over the years. He knows how to use his actors’ physicality too; J.K. Simmonds gives an extremely intense performance and through the positioning of his camera Chazelle emphasises and shapes the contours of Simmond’s face as if he were a sculptor trying to represent all of human rage and determination. Counterbalancing Simmond’s towering presence is Miles Teller’s quieter but equally intense work. If I’m honest this was the first time I have seen him act but he is very much on my radar now and I will be keeping a keen eye out for his future roles over the coming years. Whiplash‘s story is very simple; a promising drummer enrolls at a prestigious musical academy where he encounters a terrifying coach who pushes his students to the very edge by hurling anything from vicious insults to metal chairs at them whenever they slip out of time. I used the word coach there deliberately as Simmond’s character has far more in common with a strict sports coach than any musical instructor I’ve ever seen in a film. Having said that this is not just ‘Rocky-with-drumsticks’ where hard work guarantees success as Forrest Wickman condescendingly puts it¹, instead the film addresses the question of whether pressure can create genius with depth and subtlety, refusing to come down easily on one side of the argument or another. The other really notable factor in this film is Tom Cross’ editing work. 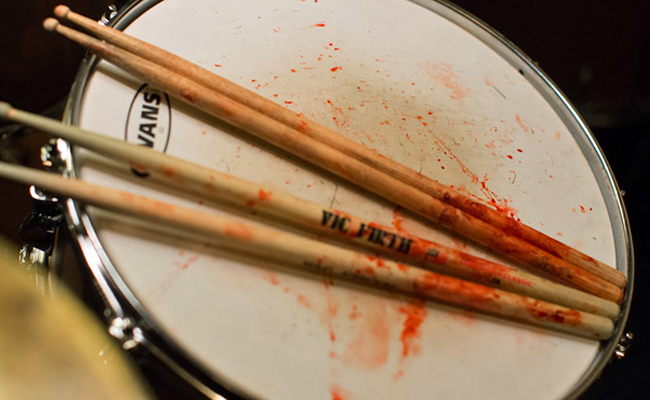 Rarely do you see a film edited as well as Whiplash; the film owes a great debt to Cross’ work as it is largely responsible for the intensity transmitted to us during those drumming sequences where the camera edits move in sync with the drum’s beats. The director, the actors and the cinematographer naturally all play a hugely important role here, but without Cross’ work I would wager that the scenes wouldn’t be half as infectious and breathtaking. And what better way to summarise the film in general then ‘infectious’ and ‘breathtaking’? I am careful when dishing out words like these for fear of over hyping a film but this one has more than earned everything which is being said about it and more. This is clearly one of the top contenders for the best film of last year. What is the film’s greatest strength? I’m going to say it’s a tie between editor Tom Cross and director Damien Chazelle. Its greatest weakness? A slight plot contrivance, but it just gets away with it. Would I see it again? Absolutely, I cannot wait to see Whiplash again. Thanks for reading, be sure to drum out your opinions in the comment box below! My favorite film from last year. You picked out some excellent points to make everyone want to watch this immediately. Thank you, I think it may well be mine too and I can’t wait to revisit it! Good review Rumsey. It was a very compelling watch, if mostly because of how electric the performances can get. Thanks Dan, sorry for the late response. I don’t know how I missed your comment! The performances, editing and direction were just, as you say, electrifying. Great review. You put it so well. An amazing movie. Thanks buddy! Sorry I haven’t responded sooner, you’re comment just slipped through the net for some reason. 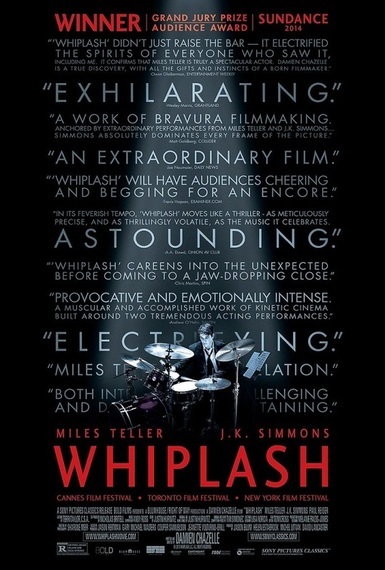 Great review and glad to hear you really liked Whiplash. It’s one of my favorites from last year. Isn’t just really impressive? Might be my top film of last year but I have yet to see Birdman. What about you? Great work James! I am so excited to see this one! Thanks Zoë, I hope you love it like I did! Really nice review. Beautifully put. I think you hit all the major things that stood out to me about this film. Thanks Chris, I was pretty pleased with this review so it’s good to hear that! I am hoping to see Whiplash this weekend and I can’t wait! You’ll have to let me know what you think of it if you do!